It's important to provide training participants with a certificate of attendance following completion of seminars, workshops or other types of classes. This is just as true for on-site company training as it is for training sessions that are open to the public. 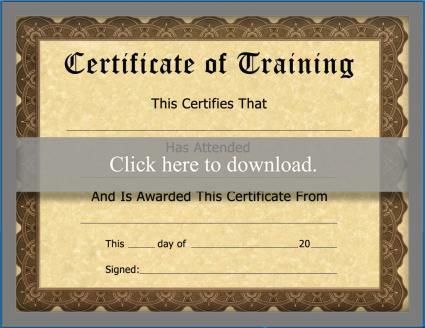 If you organize, deliver or manage training sessions, you'll most definitely find yourself needing to create training certificates of completion quite frequently. Rather from starting from a blank page for each training session, it's a good idea to set up a go-to template that you can edit quickly and easily. The template provided here is a great option. To access the document, simply click the image and it will open as a PDF file that you can save to your computer or external storage device and customize with your company's logo and details specific to each training topic and session that you offer. Any time you deliver a new class, simply open the template that you've created and change the course name, date, number of hours and you'll be ready to print a certificate for each attendee. If you have any trouble working with the PDF, use this guide to Adobe printables for assistance. Since the certificates already contain nice borders, there is no need to print them on fancy paper. 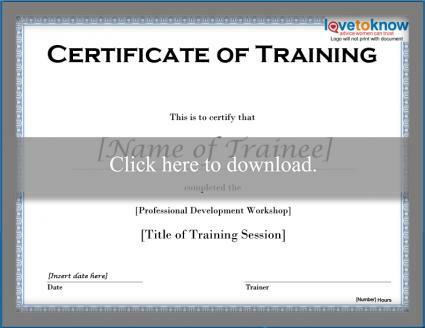 Another certificate of training, this one is ideal for a session or an entire series. It has spots for the name of the participant, the date, the event and a line for the company name. This is a write in certificate - great for last minute additons. 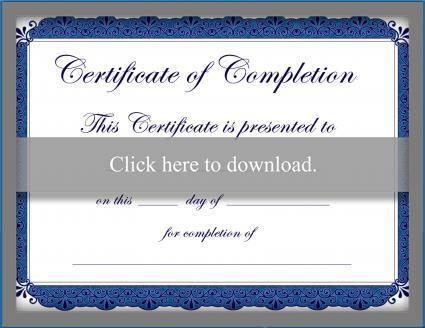 This certificate of completion is ideal for situations in which a person has undergone training that is over a series of sessions. The certificate has template fields so you can input the information before you print and then print out the certificate to congratulate the accomplishments for your trainees. The fields include a spot for your trainee's name, the date and the type of training or program that the trainee has completed. You can open the document in the same way as the one above. 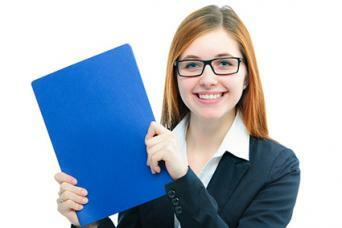 For added durability, make sure to print on index card paper, which is available wherever you buy printer paper. It's slightly thicker than regular printer paper, but thinner than card stock - which is a bit too thick for award certificates. Setting up a template that you can quickly edit any time you need to produce certificates of completion, whether for a seminar or safety training, for trainees is a great way to simplify the process. Just be sure that each attendee receives a certificate that looks nice enough to frame and that can also be placed in his or her personnel file as documentation of employee development efforts.